8 local food trucks: Bad Dog, Bella Sorrella Pizza, G’s Cue BBQ, Fronana, Jimmie’s Streatery, Just Jerks Jamaican Grill, Taqueria Mixteca Xpress, and Wicked ‘Wich of Dayton. Lots of fun family activities, including face-painting, kickball, and a hula hoop contest! An afterparty at South Park Tavern right after the event! 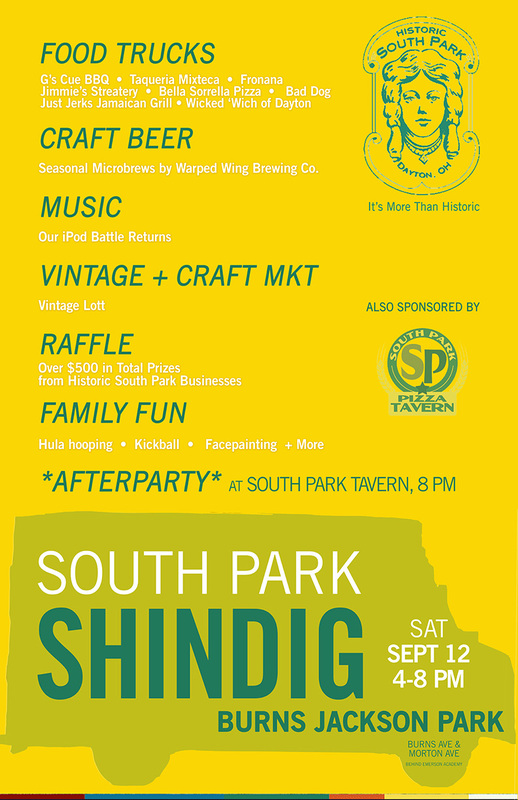 SHINDIG 2015 will take place at Burns Jackson park (at the end of Burns Ave. in South Park, just behind Emerson Academy). This event is sponsored by Historic South Park Inc. and South Park Tavern. Bring your family, friends, pets and join us in celebrating our neighborhood’s sense of fun and community spirit! SHINDIG 2015 is made possible via the generous support of many local businesses and organizations, including: the City of Dayton, WYSO 91.3, South Park Tavern, Dayton’s Original Pizza Factory, Ghostlight Coffee, Jimmie’s Ladder 11, Coco’s Bistro, Lindy and Company, Custom Frame Services, Remember When Antiques, Wireless Options Ohio, the Dayton Visual Arts Center, the Home Group, Emerson Academy, the Next Wave, and more.